When you watch a video on the web or your mobile phone, the odds are pretty good you are using the MP4 video format and the H.264 codec. There are a lot of choices when it comes to video formats. But, MP4 is the top pick for both web and mobile viewing. Same results for local videos. Thus there is a strong need of MP4 video transcoder for Mac to convert videos to MP4 for Mac users. But which MP4 video converter for Mac to choose? It all depends on your various demands, but making a choice among best MP4 converter Mac indeed. As one of the best Mac MP4 video converter, MacX Video Converter Pro is capable of converting videos to MP4 on Mac (macOS Mojave), as well as converting MP4 to various formats, including MKV, AVCHD, M2TS, FLV, AVI etc. So if you are willing to convert MKV to MP4, AVI to MP4, WMV to MP4 etc. for iPhone iPad or Android devices playback, this program will provide a perfect solution for MP4 files conversion. Besides, the brand-new Intel QSV/Nvidia/AMD GPU hardware acceleration tech ensures the world's fastest conversion speed, 16X faster than before and no quality loss. Furthermore, it also enables you download videos and music from 1000+ sites and convert YouTube to MP4, MP3 for offline playback. 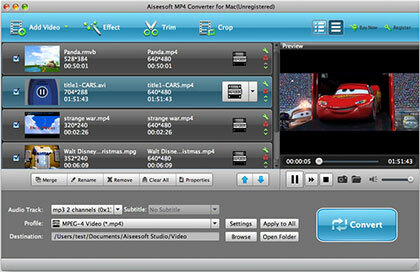 The greatest strength of MacX Free MP4 Video Converter is that it's totally free. This free MP4 video encoder supports converting any video formats to MP4, like AVI to MP4, MKV to MP4, AVCHD to MP4, etc. Strictly speaking, this program is the lower version of MacX Video Converter Pro. Thus it may lack some salient features compared with the advanced edition, like speed and limited formats supported, unavailable on Mac El Capitan etc. But anyway, it's enough for simple converting MP4 videos as a free Mac MP4 converter. Free MP4 Converter is professional Mac MP4 Video Converter software, which helps you convert any video format to MP4 video for playback on iPhone (iPhone Xs Max/Xs/X/8/7), iPad (iPad Air 2/mini 4), iPod, and Apple TV. You are easy to convert HD video, AVCHD video, and common video like AVI, WMV, FLV, MOV, MPEG, M4V, MPG, 3GP to MP4 format in batch. To our suprise, this awesome MP4 program allows to convert files of large size (over 100MB) instantly, no trouble at all, which is superior to other free video converter. Aiseesoft MP4 Converter for Mac is the best Mac MP4 Converter that can convert all video formats (including MPG, MPEG, VOB, MP4, M4V, TS, RM, RMVB, WMV, ASF, MKV, AVI, 3GP, FLV, SWF, M2TS) to MP4, MOV, AVI, FLV, MKV, WMV and other popular video formats at super fast conversion speed and with excellent output quality. With the best MP4 file Converter Mac you can output videos to iPhone 6s/iPhone 6, iPhone 5, iPhone 4S, iPad, iPad 3, iPad mini, iPad 4, Samsung Galaxy S4. But it's a pity that this software newly supports Mac OS X 10.10. (Yosemite). Thus if you are in Mac El Capitan, you must move to another one. Miro Video Converter is 100% free and open source, providing a beautiful , simple way to convert almost any video to MP4, WebM(vp8), OGG Theora etc. It also has presets that will convert video to the correct sizes and formats for popular phones, iPods, and other media players, such as Samsung Galaxy Note, HTC One X, iPod Touch 4+, Kindle Fire and so on. Just convert your video and copy it to your device. Compared with other media converter for Mac, Miro is less competitive for the limited formats, preset devices supported. but I have to say it's quite enough for those who want to convert videos to MP4 on Mac for free. 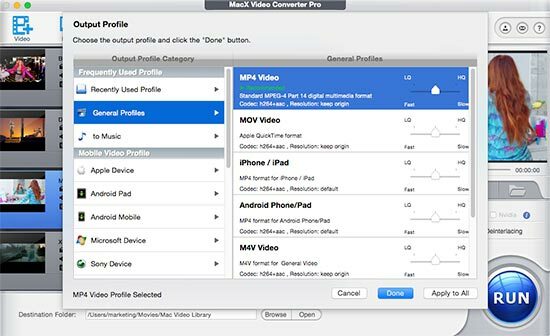 MacX Video Converter Pro - Convert video to any formats and devices, MP4, MOB, MKV, FV, H.264, HD, iPhone Xs Max/Xs, iPad Pro/mini 4, etc. with world's fastest speed and original quality. No adware, malware. How to Convert Video to MP4 with Best MP4 Video Converter for Mac? Free download the MP4 video transcoder for Mac or Windows version for PCs, launch it and click "Add File" button to load the video files you want to convert to MP4. After adding video file, the video's information, such as name, video size, video length, duration and output will be shown in the file list. Choose "to MP4" as output video format. Step 4: Convert Video to MP4 Files Now. After finishing the above settings, press "RUN" button on the main interface, to start converting video to MP4 files on Mac. You can view the conversion progress from the progress bar at the bottom of the dialog box. In conclusion, MP4 format is widely needed no matter on web or mobile devices. Naturally, for those formats outside MP4, MP4 Converter Mac can be a good assistant for finally enjoying MP4 videos on iPhone, iPad and Android devices. As it mentioned above, it all depends on your various demands on video conversion to choose the best fit Mac video converter for MP4. Anyhow, pick one of them and have a try for your MP4 conversion!